Not being separated from the dogma of the fashioner. 1. How could we adequately express admiration of the famous Markianos?1 Clearly by classing him with Elijah and John and those like them, who "went about in skins of sheep and goats, destitute, afflicted, ill-treated, of whom the world was not worthy, wandering in deserts and mountains and caves and the holes of the earth." This man had as his fatherland formerly Cyrus, which I mentioned above, and thereafter the desert; and leaving both the one and the other he now has heaven. The one gave birth to him, the other nurtured him and made him victorious, the third received him as one crowned. 2. Despising both the distinction of his family (for he was of noble descent) and an illustrious position at court2 (for it was there he flowered, receiving great bodily size and beauty from the Creator of nature and having a soul adorned with sagacity), he transferred all this love to God and the things of God. Bidding farewell to all this, he repaired to the heart of the desert, and built a small cell that was not even the size of his body. Surrounding it with another small wall, he was immured continuously and deprived of all human company, while conversing with the Master of the universe and hearkening to that sweet voice, for in reading the divine oracles he held he was enjoying the divine voice, and by praying and making supplication he conversed with the Master. In his constant enjoyment of such delight he refused to experience satiety; for he had heard the divine Spirit chanting through the great David that "he who meditates on the law of the Lord day and night will be like the tree planted by the outlets of waters, which will give its fruit in its season, and its leaf will not fall." In his desire for these fruits he embraced this most pleasant labor; psalmody succeeded prayer, prayer succeeded psalmody, and both again were succeeded by reading the divine oracles. 3. His food was bread alone, and this taken according to measure: the measure was such as to satisfy the need not even of a child just separated from the breast, for they say that his pound of bread, divided into four, was distributed over four days, with one portion assigned to each day. He had resolved to eat each day in the evening, and never to experience satiety, but to be always hungry and always thirsty, supplying the body with the bare necessities of life; for he used to say that he who takes food only at the interval of several days performs the Master's liturgy in a weak state on days of fasting, while on a day when he eats food he naturally takes more and burdens the stomach, and this, weighed down, makes the soul more sluggish at keeping vigil. It was therefore better, he said, to take food each day and never expect satiety, since the true fast is perpetual deficiency. This man of God persevered in laying down this rule; and although he had a very big body, being indeed the biggest and most handsome of all the men of his time, it was with little food that he nourished it. 4. After some time had passed, he admitted two to live with him: Eusebius, who became the inheritor of this sacred cell; and Agapetos, who transplanted this angelic rule to the region of Apamea. There is a large and populous village whose name is Nicerte. In it Agapetos founded two retreats of philosophy, one called after his own name and the other after that of the wondrous Symeon, who was conspicuous in this philosophy for a total of fifty years.3 In them there are living even today more than four hundred men, athletes of virtue and lovers of piety, purchasing heaven with their labors; the legislators of this way of life were Agapetos and Symeon, who received their laws from the great Markianos. From these were planted innumerable other ascetic dwellings regulated by these laws, which it is not easy to count; but the planter of them all was this inspired man, for he who provided the finest seed could fairly be called the cause of the good plants. 5. At first, as I said, he lived in this voluntary prison on his own. Then when he admitted these two, he did not have them live with him; for the hut was not adequate for himself alone, being extremely small and causing him, whether sitting or reclining, much discomfort: when standing he was unable to hold himself erect, since the roof made him bend his head and neck; nor when lying down could he stretch out his feet, since the cell did not have a length equal to his body. So he told them to build another one and bade them live there, singing hymns, praying, and reading the divine oracles on their own. When more people needed to share in this benefit, he ordered another dwelling to be built at a distance and bade those who wished live there. Their superior was Eusebius, who transmitted the teaching of the great Markianos. The great Agapetos, when he had received the necessary training and exercise and learnt well this athletic skill, departed, as I said, and sowed the seeds he had received from that godly soul. He became so notable and celebrated that he was counted worthy of an episcopal see, appointed to the charge of a flock and entrusted with tending his own fatherland. 6. The wonderful Eusebius, while presiding over the flock he had gathered together, took over looking after his teacher as well: he alone was counted worthy to pay him timely visits and enquire if he wanted anything. On one occasion, wishing to see what he did at night, he dared to go up to the window (which was small); and peering in, he saw a light, not of a lamp or made by hands but God-given and of the grace from above, flashing from the teacher's head and revealing the composition of letters in the divine oracles, for he happened to be holding a book and searching out the inviolate treasury of the divine will. Seeing this, the wonderful Eusebius was filled with dread and became full of awe; he was instructed about the grace poured down upon the divine ministrant and learnt the goodwill of God towards his servants. 7. On another occasion, when the great Markianos was praying in the forecourt, a serpent crawled up onto the wall facing east, and leant down from the wall gaping and looking grim at the same time, displaying his intention. Standing at a distance, Eusebius, frightened at this terrifying sight and presuming his master did not know of it, indicated it by crying out and begging him to flee. But he rebuked him and told him to cast off his cowardice, saying that this too is a destructive passion, and he made the sign of the cross with his finger and blew with his mouth, intimating the ancient enmity. The serpent, withered and, so to speak, burnt by the breath of his mouth as if by some fire, was dissolved into many fragments like straw that is set ablaze. 8. Therefore examine with me if he did not imitate his Master as a well-disposed servant; for the Master, once when the sea was raging against his disciples' boat and he saw them panic-stricken, did not curb the surge of the sea before he had put an end to the disciples' lack of faith with a rebuke. Taught by that, this wonderful man first dispelled his companion's cowardice and thereafter delivered the beast to punishment. 9. Such was the wisdom of the great Markianos, his working of miracles and his familiar access to God. Nevertheless, despite receiving such grace and being capable of great miracles, he was keen to hide his power, suspecting the machinations of the thief of virtue, for he sows secretly the passion of arrogance and tries to steal the fruits gathered with toil. Eager to hide the grace given to him, he worked miracles reluctantly, as the splendor of his achievements flashed forth and revealed his hidden power. And indeed there occurred the following miracle. A man of noble family and often appointed to military commands, who originated from Beroea in Syria, had a daughter who for a long time had been delirious and raving, troubled by an evil demon. He repaired to the desert, since, being acquainted with the great Markianos, he expected to meet him and make entreaty on the ground of their former acquaintance. Being disappointed of his hope and failing to see the servant of God, he besought an old man, who at that time was entrusted with serving the man of God, to take a little flask full of oil and place it by the very door of his cell.6 The old man, after refusing the commission several times and several times being pressed again, yielded to the request. The great Markianos, hearing the noise, asked who it was and what he had come for. The old man hid the true reason and pretended he had come to find out if he had some order to give, and on saying this was sent away. The next morning the father of the girl asked for the flask to be returned to him; the old man went off in trepidation as quietly as he could and, stretching out his hand, tried to take the flask without being noticed. The other again asked what he had come for, and when the old man gave the same reason which he had offered in the evening, the man of God was annoyed at the old man's visit taking place contrary to custom and ordered him to tell the truth. The old man, in fear and trembling and unable to deceive the man full of divine grace, said who had come, told of the tragic illness and showed the flask. The other was indignant, as was natural for one not willing to display his power; nevertheless, after threatening that if he dared such a thing again he would be deprived of his company and stripped of his role of service - a great penalty for those who knew the benefit of it -, he sent him away with instructions to return the flask to the giver. As he gave this order, the demon at a distance of four days' journey cried out at the power of the one who was driving him out. Markianos was effecting in Beroea the work of judges, using as it were executioners against the demon, driving out the miscreant and freeing the girl of his activity.7 The father of the girl ascertained this exactly. As he was returning and was a few stades' distance from the town, he was met by a servant whom his mistress had sent into the country; on seeing his master he told him the good news of the miracle that had taken place, saying it had taken place four days before. So counting the days and determining the time exactly, he discovered it was that time when the old man brought out the flask. 10. The thought that occurs to me is, what could this great man not have done if he had wanted to work miracles? If he emitted such luster when eager to hide the grace he had received, what prodigies would he not have worked had he wished to? Likewise he did not display his spiritual wisdom to all, although finally he gave those who wanted it permission to come to him after the festival of the Lord's passion and the Master's resurrection. At this season, of course, all were eager to see him. 11. On one occasion the leading bishops assembled and came to him - the great Flavian, entrusted with shepherding Antioch, the divine Akakios whom I mentioned above, Eusebius of Chalcis, and Isidore, then entrusted with governing Cyrus - all of them preeminent in virtue.8 And with them was Theodotos who held the reins of Hierapolis, glorious for asceticism and gentleness; present too were some councilors and officials possessing the spark of the faith. When they all sat in silence and waited for his sacred utterance, he too sat in silence for a long time, stilling his tongue while exercising his hearing. Then one of those sitting, who was well-acquainted with him through spiritual direction and in addition was glorious in rank, said, "All the divine fathers are athirst for your teaching and await from you most pleasant streams: so bestow a benefit on all those present and do not hold back the flow of your beneficence." But he, with a great sigh, replied, "Each day the God of the universe speaks through creation and discourses through the divine Scriptures, recommends what is necessary and proposes what is advantageous, alarms with threats and encourages with promises, and yet we reap no profit. How then could Markianos benefit by speaking, when he rejects such benefit along with the rest and is unwilling to find profit therein?" This stimulated much discussion among the fathers, which I have thought superfluous to include in my narrative. Standing up to pray, they wanted to confer on him ordination to the priesthood, but they baulked at the attempt. Each one urged another to do it, but all likewise declined and made their return. 12. I wish to add to this another story to make known his divine understanding. A certain Avitus was the first to set up his ascetic cell in another desert, more northerly than this one and lying a little to the east, under the north wind that is near to the east wind. He was older than Markianos in both age and labor, a philosopher nurtured in the austere life. Learning that the man's virtue was common talk everywhere and thinking such a sight more advantageous than protracted solitude, he hurried apace to see what he longed for. Learning of his arrival, the great Markianos opened the door and received him into his presence. He bade the wonderful Eusebius cook pulses and greens if he had any. When they had had their fill of mutual conversation and had learnt of each other's virtue, they performed together the liturgy of the ninth hour; and Eusebius came bearing the table and bringing loaves. The great Markianos said to the inspired Avitus, "Come over here, my best of friends, and let us share this table." But he said, "I do not know that I have ever taken food before the evening, and I often continue without food for two or three days together." The great Markianos replied, "Change your habit today, at least for my sake. Being in a weak bodily state I cannot wait till the evening." When these words did not persuade the wondrous Avitus, he is related to have sighed and said, "I am utterly discouraged and cut to the heart at this: after undergoing such labor in order to see a laborious man and philosopher, you have been disappointed of your hope, and have seen instead of a philosopher a tavern-keeper and profligate." This distressed the most divine Avitus, who said that, rather than hear such words, he would be glad to take meat.9 The great Marcianus continued, "We too, my friend, lead the same life as you and embrace the same profession, honor labors before repose and prefer fasting to nourishment, and take it only after nightfall. But we know that love is a thing more to be prized than fasting, since the one is a work laid down by divine law, while the other depends on our own authority. It is right to count the divine laws as far more to be prized than our own." After conversing with each other in this way and partaking of slight nourishment, singing hymns to God and spending three days with each other, they parted, seeing each other again only in spirit. 13. Who then would not wonder at this man's wisdom, governed by which he knew the time for fasting and the time for brotherly love, and knew the distinction between the parts of virtue, and which ought to yield to which, and which be given the victory at the proper time? 14. I have another story to make known his perfection in the things of God. There came to him from his fatherland his sister with her son, now a man and a leading citizen of Cyrus; she brought a lavish supply of the necessities he needed. He did not consent to see his sister,10 but received his nephew, since it was the time laid down for meeting people. When they begged him to accept what they had brought, he asked, "Through how many monasteries have you come? To which of them did you give some of this?" When his nephew replied that they had given to none, he said: "Go away with what you have brought, for we do not need any of it, nor if we did would we accept it. For you have done us this kindness out of consideration for physical relationship but not for the service of God; for if it was not only closeness of kinship that you valued, you would not have apportioned what you brought to us alone." With these words he dismissed his nephew with his sister, after giving orders that not even a little of what they had brought was to be accepted. 15. In this way he transcended nature and crossed over into the life of heaven. How could one produce a clearer proof than this that he was worthy of God, according to the utterance of God himself, who says, "He who does not leave father and mother and brothers and sisters and wife and children is not worthy of me?" If he who does not leave them is unworthy, he who leaves them and practices so strict a perfection is clearly most worthy. 16. I myself, in addition to this, admire also his strictness over the divine doctrines. For he abhorred the madness of Arius, which at that time was being kindled by imperial authority; he abominated the folly of Apollinarius; he fought nobly against those of Sabellius's persuasion, who lump the three hypostases into one; and he rejected utterly those called Euchites, who hide under a monastic disguise the disease of the Manichees. 17. So fervent was his zeal for the doctrines of the Church that he engaged in a just battle with a man who was wonderful and godly. In that desert there was a certain old man called Abraham, a man hoary in hair and hoarier still in thought, glorious in every virtue and always shedding tears of compunction. At the beginning, misled by a certain simplicity, he presumed to celebrate Easter as previously, in apparent ignorance of the rule laid down on this matter by the fathers at Nicaea, preferring to be tied to the ancient custom - many others at this time suffered from the same ignorance.12 But the great Markianos used many arguments on many occasions to try and lead Old Man Abraham - for so the local people called him - back into the harmony of the Church, and on seeing him obstinate, he publicly separated himself from communion with him. But when time had passed, that inspired man cast off this reproach and embraced the harmony of the divine festival, chanting in truth, "Blessed are those without reproach on the way, who journey in the law of the Lord." And this was the achievement of the teaching of the great Markianos. 18. Many everywhere built him burial shrines - in Cyrus his nephew Alypios, in Chalcis a certain Zenobiana, glorious in birth, preeminent in virtue and flourishing in abundance of wealth, and not a few others did the same thing, in competition to carry off this victorious athlete. Knowing this, the man of God adjured that wonderful Eusebius, imposing on him oaths fraught with every terror, to bury his body in that spot and inform no one of his grave, save two of his more intimate companions, until a great number of years had passed.13 That wonderful man carried out this oath: when the end of the victor had come and the choir of angels transferred that sacred and godly soul into the abodes of heaven, he did not announce his death until, with the two companions most close to him, he had dug the grave, buried the body, and leveled the surface of the ground. Fifty years or more passed by, a countless number hastened along and searched for the body; yet the grave remained undetected. When each of the shrines mentioned above had received remains, one of Apostles and the other of martyrs, the heirs of his earthly tent and teaching were now reassured. Having prepared a stone coffin two years earlier, they placed in it the remains of his precious body, once one man - for he alone of the three was left - had pointed out the tomb. 19. Having become an emulator of his virtue, the wonderful Eusebius continued to wear away his body by still more labors. Although wearing one hundred and twenty pounds of iron, he laid on himself the other fifty of the most godly Agapetos and also added the eighty of the great Markianos. He had as his oratory and dwelling a certain cistern that lacked water, living in this way for a total of three years.14 I have made this digression wishing to show for how many others the great Markianos was the cause of great achievements. 20. His philosophy also profited the wonderful Basil who a long time later built his monastic dwelling near Seleucobelus - it is a city of Syrial. And who, while glorious in many other forms of virtue, was especially glorious in the possession, dear to God, of philanthropy and in the divine work of hospitality. Indeed, who could number with ease those whom, in the words of the Apostle, he presented to God as workmen with no need to be ashamed, rightly handling the word of truth? 21. Omitting at present the others, who though worthy of eulogy would cause lengthiness in the account, I shall mention only one of them. There was a disciple of this man, named Sabinos, who expended his body on innumerable labors. He took neither bread nor anything cooked; his food was meal soaked in water. It was his custom to prepare together all the food for the month in such a way that it went moldy and emitted a great stench. The character of such food was intended to blunt his bodily appetites, and by the stench of the food extinguish pleasure. While living in this way on his own, if ever one of his acquaintance came, he would partake in simplicity of everything that was served. 22. He had received such grace from God that a woman of the nobility, distinguished in birth and wealth, hastened to him from Antioch and begged him to help her daughter who was beset by a demon: "I had a dream," she said, "that bade me hasten here and get healing for my daughter from the head of the monastery." The monk who gave answers replied that it was not the custom for the superior to speak with women. When the woman persisted, weeping and wailing and imploring bitterly, the superior of the monastery came out. But the woman said it was not he but another - ruddy and with spots on his face - who had been indicated to her. When they realized whom she was seeking - the third in the monastery, not the first -, they persuaded him to come to the woman, and immediately she recognized his face. The evil demon cried out and departed from the girl. 23. Such were the achievements of the disciples of disciples of the great Markianos; such were the plants that the excellent planter planted everywhere. I myself again, after bringing this account to an end, beg and entreat through the intercession of them all to obtain the help of God. 1. Markianos (Marcianus) was an ascetic of the region of Chalcis in Syria, living about sixty miles from Beroea in Syria; we may deduce from that he died in the 380s. Both he and other ascetics mentioned in this chapter - Agapetos, Symeon, Avitus, Abraham - are listed in Theodoret, Eccl. Hist. IV.28(25) under the reign of Valens (364-378), though Markianos may well have entered on his labors some time earlier. 2. The meaning is probably that Markianos at a young age received the honor of nominal membership of the senate of Constantinople, with the style clarissimus. 3. Theodoret himself had been a monk of one of these monasteries at Nicerte, prior to becoming a bishop in 423. Symeon is presumably the 'priest and monk of the territory of Apamea' who was an ally of John Chrysostom and received an extant letter from him (ep. 55) in c.405. 4. Agapetos was made bishop of Apamea in 388. 5. For a demon in the form of a dragon being routed by the sign of the cross see Life of Anthony 23. 6. Theodoret is clearly tolerant, but some bishops, such as Rabbula of Edessa (437), saw this as a threat to the sacramental power of the ordained clergy. 7. This visit probably dates to 381, the very year of Flavian's ordination. Flavian's position was insecure, in that there was a rival orthodox bishop at Antioch (Paulinus, recognized by Egypt and the West) and he therefore had special need of monastic support. In any case, the story illustrates both Markianos's reputation and the trouble bishops took to maintain close relations with holy men, who might otherwise be rival centers of authority. Doubtless, the bishops' idea of ordaining Markianos priest (see end of paragraph) was motivated by a desire to place his spiritual authority firmly under the aegis of his bishop. 9. 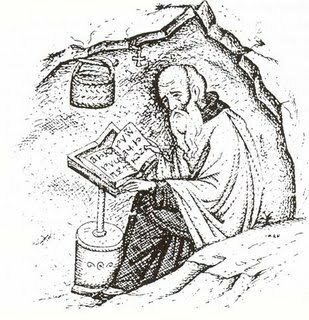 The force of the remark lies in the fact that many monks never ate meat; see Athanasius on Antony's diet: 'Of meat and wine it is superfluous to speak, since neither with other earnest men was anything of the kind to be found' (Life 7). 10. Monks naturally avoided meeting women, even close relatives. 12. At Antioch, and in several neighboring provinces, Easter was traditionally celebrated in immediate proximity to the Jewish Passover, a practice that was condemned in 325 at the Council of Nicaea. But the older custom continued to have its adherents, who were excommunicated by the Antiochene Council of 341 and are the objects of attack in an anonymous homily of 387 (published in Sources Cbretiennes, vol. 48). 13. The dying St. Anthony likewise instructed his two companions to tell no one where they buried him; his body was only 'discovered' in the sixth century. 14. For a hermit living in a disused cistern, cp. XII1.2, XXVI.6. 15. Seleucobolus was a town near Apamea.